Envirothon is a competitive learning event for high school-aged students. 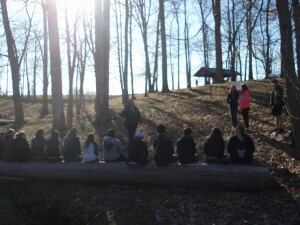 Envirothon tests the student’s knowledge of environmental resources including aquatics, soils, forestry, wildlife and current environmental issues. “Like” the Indiana Envirothon on Facebook and check out the NCF Envirothon site. Indiana Envirothon appreciates the support of the following sponsors of our 2019 Competition. This support helps make the Indiana contest a quality event for high school students across the state. This year’s Indiana Envirothon Competition was held at the end of April at the Beck Agricultural Center at Purdue University. Thank goodness it was a bright, albeit chilly, day up north. 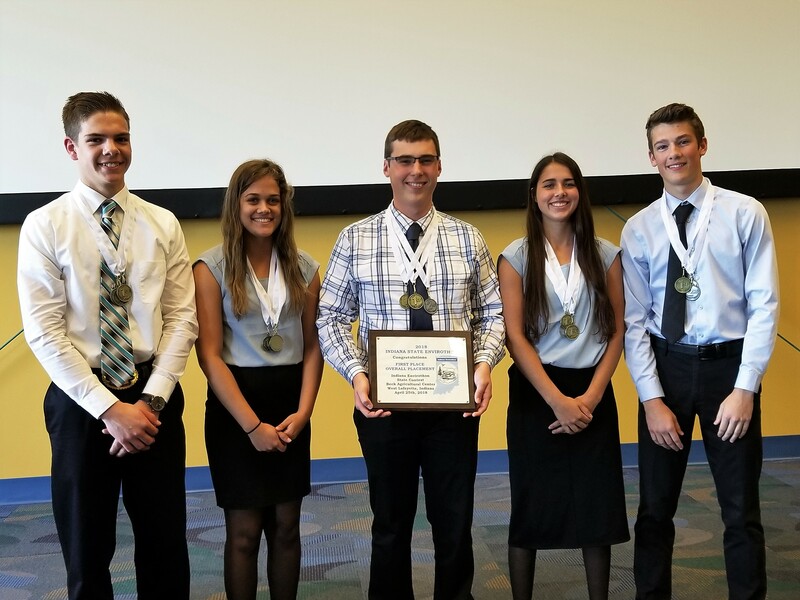 17 teams from around the state who were 1st, 2nd and possibly 3rd place winners from their local Regional Envirothon contests competed for the honor of representing Indiana at the NCF Envirothon competition in late July at Idaho State University, Pocatello, Idaho. The Envirothon gives high school students the opportunity to prove their knowledge of various environmental issues and one current issue. Areas include soils, water, forestry and wildlife. This year’s current issue dealt with Rangeland. The goal is to build awareness and the contest helps show tomorrow’s leaders the positive and negative effects that individual actions have on the environment. Students understand the difference between renewable and nonrenewable resources, realize environmental interactions and interdependencies and know who to turn to concerning environmental matters. Hopefully, the students also have fun while becoming environmentally aware during the competition. Students compete for awards in three areas – written, oral and overall. There is a hands-on portion of the contest included in the written scores. This year’s winners in the Written division were Rossville – Hannah, 1st place; Gibson Homeschoolers, 2nd place and Noblesville 3rd place. The winners in the Oral Presentations were Rossville – Idaho, 1st place; Rossville – Hannah, 2nd place and Gibson Homeschool 3rd place. Overall winners were Rossville – Hannah 1st place; Rossville – Idaho, 2nd place and 3rd place went to Gibson Homeschool. The Rossville – Hannah students will represent Indiana at the NCF Envirothon contest July 22 – 28th at the Idaho State University in Pocatello, Idaho. Each year, Envirothon provides more and more students with a chance to get “up-close and personal” with North America’s natural resources. Envirothon offers both in-class curriculum and hands-on field experiences focused around ecology, natural resource management and current environmental issues. This unique combination of learning experiences and breadth of study is part of what has made the Envirothon a huge success with students and educators across the United States and Canada. To learn more about the North American Envirothon, explore the information and resources available on their website. The Trade Show at the Annual Conference of Indiana Soil and Water Conservation Districts is an excellent opportunity to connect with 450 conservationists representing rural, urban, and suburban natural resources interests in Indiana. Conference attendees represent land users from across the natural resources spectrum: staff and elected/associate supervisors from county Soil and Water Conservation Districts; farmers; watershed organization staff; technical resource staff from state and federal conservation agencies; and other representatives from the Indiana Conservation Partnership. Trade Show hours: Monday, January 14 from 8 am to 5 pm. Tuesday, January 15 from 8 am to 12 noon.